Do you want to make a large quilt, but don't have a lot of time? 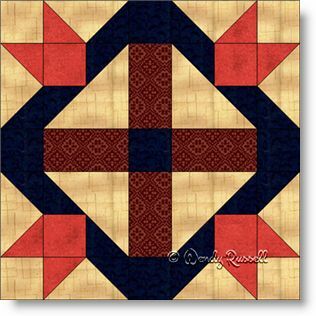 The 14" inch quilt block might be your choice. Larger sized blocks equal less blocks to make and the "finish line" is in sight faster. Fourteen inch blocks are typically made as seven patches, as they are designed on a 7 x 7 grid. The David and Goliath quilt block is an addition to my ever-growing collection of biblical blocks. This is a seven patch (since it is designed on a 7 x 7 grid), but I choose to construct it using my favourite method -- as an uneven nine patch. This method works in what I call "chunks" rather than sewing row-by-row. However, if the latter is your preference, then you choose which method is right for you. The block features lots of half square triangles and flying geese patches, to keep you in practice. The two sample quilts illustrated use standard layouts. One has blocks set side by side while the other uses an on point setting with sashing strips separating the blocks and a few blank blocks added in order to feature your quilting.